Seems there some over eager guys working at Verizon or Nokia USA who just couldn't wait for the Nokia Lumia 928 to be announced on May 14th. 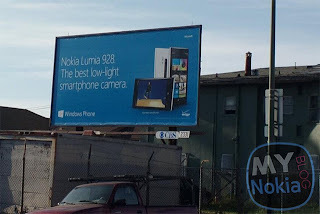 The Latest and greatest Nokia Lumina device yet has broken cover and has spotted on a billboard advertising it as the best low light camera. The Nokia Lumia 928 improves on the Lumia 920 by adding a xenon flash to the dual LED which makes taking good pictures in the dark an easy task to accomplish. The Lumia 928 would also have a 4.5 inch touchscreen and a 8 mega pixel camera.